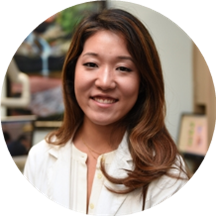 Dr. Seong is a caring and compassionate general dentist serving the community of Forest Hills, NY. She obtained her Doctor of Dental Surgery degree from Stony Brook School of Medicine. She sees patients for dental consultations, root canals, dentures, implants, and dental emergencies, as well as other common and specialized reasons. Dr. Seong is well known for her meticulous cosmetic dental work. She will design your new beautiful smile applying all of her knowledge and expertise; paying attention to every little detail of your profile, always considering your expectations and never compromising function and quality. She is an expert for improving the aesthetic appeal of a person’s teeth, gums, and overall, smile. She is also known for her kind demeanor and ability to having her patients feel at ease. She provides great care and comfort to her patients while providing the best technology in dentistry along with many treatment options. Dr. Min jung Seong and her team were very kind and welcoming. The front desk receptionists were very kind and informative. Dr. Seong was very gentle handled all my questions kindly. I would definitely be back. The only down side was,I needed a work note and asked them to email it to me and never received it even though I called the front desk twice to remind them. It was a good visit. She did my filling and that was great. She just came in for five minutes, looked at my teeth, offered Invisalign, and then left. But other than that, it was a pretty good visit. I'd recommend her for sure. Really excited to correct my smile with Austin Dental Plus! My first time in the office and everyone makes you feel really welcome. The office is extremely warm and modern (Netflix at every chair while you're getting work done? YES PLEASE! ).It's a blessing for ANYONE looking for a comfortable dentist office you WANT to go to. I came in for a fix and repair so I was already in pain and apprehensive. The office manager, Astrid Engelbrecht came around and introduced herself and made it a point to make sure my experience was more than welcoming. She even worked with the team in creating a REALLY AWESOME & AFFORDABLE plan to get me smiling with confidence again! Dr Seong did an amazing job at starting the process. She's really attentive to detail and making sure your absolutely comfortable. Really excited to start this journey with them! Dr. Min was very kind and knew what she was doing. She was also very flexible. I would greatly recommend her! Clean facilities. Staff were all welcming and friendly. They really seem to care and take time to educate you on best practices. staff are nice, friendly , same as Dr Seong. The office is beautiful and very clean. The staff was absolutely amazing. The office manager was on her way out while I was in the waiting area, but stopped to introduce herself and the office/services. Elizabeth took my x-rays and hadwonderful bedside manner. Crisly, my hygienist, was great. She explained everything she was doing. She suggested Invisalign, and with a mirror showed me why I needed it. Dr. Seong was great also. Ashley was very patient and mindful with me when explaining the Invisalign process. First visit to this office and they all made a wonderful impression. Considering how much I do not like dentist appointments, I'm at ease for my following appointment. Everything was fine except I did appointment to get fillings done, instead they did x-rays and exam, even thought they already had the the x-rays from another office. So not was I was expecting. My overall visit was great plus it's a beautiful office! Heidy, the dental hygienist was amazing and very helpful with all of my questions. Dr. Seong was also great and very friendly. Although the wait was a bit longer than expected I would highly recommend this dental office. The Clinic was clean and everyone was professional.